Huzzah! I did not destroy the pie! My three fears were apparently unfounded: the crust was not soggy or underbaked, the lattice worked, and the filling didn’t whoosh out in a tidal wave of cherries when I cut it. I had picked up four bags of dark, sweet, frozen cherries, because the Pie Cherries available at the local store looked, well, gross. They were in a jar, vaguely pink, swimming in translucent fibrous particles that reminded me more of a science lab than dessert. It wasn’t until I got home that I realized that almost every pie recipe out there calls for sour (i.e. “pie”) cherries. I decided not to make a second trip out to a larger, better stocked grocer, because not only was I lazy, but I was lazy with a plan. I could make my own recipe, I thought. I had at least one lime in the fridge, surely that would balance the cherries sweetness if needed. It was definitely successful! Stewart had two pieces right off the bat, and I’m hoping the pie will last long enough to share with some friends. Click the link below for a full recipe and step-by-step photos. In a food processor, combine the flour, salt and 1 tsp sugar until well mixed. Add the butter using pulses until you no longer see chunks of butter in the dough. It should look like damp sand trying to clump together, but it will feel dry. Use pulses to get everythig to mix together correctly, it does a better job of breaking up the butter than just letting the machine run. Slowly add the ice water a tablespoon at a time while pulsing the dough until it is evenly distributed and it begins to look like little peas/play-dough. You may not need to use all the water! You do not want the dough to be too wet – it should not be sticky, but should hold together, barely. Be cautious, or you’ll need to start over. Remove the dough from the food processor and knead for a few minutes until it begins to smooth out. Do not over-knead the dough, you just want it to come together and smooth out a little bit, it should really only take 1-2 minutes. Divide the dough in half, flatten into discs, cover in plastic wrap and refrigerate for about an hour. You can also freeze this dough and this point for later use. While your dough is chilling, prepare the filling. Place the cherries and any juice in the bag in a large pot over medium heat. Add the sugar and the optional zest and stir gently to minimize breaking the cherries. Mix the water, lime juice, and cornstarch together in a small bowl until dissolved. When cherries begin to simmer, add the cornstarch mixture and stir until incorporated. Simmer for another few minutes until filling is thick and bubbly, remove from heat and let cool. Preheat the oven to 425Âº. Remove one of the discs of dough from the refrigerator and roll out in roughly a circle on top of a layer of wax paper. If you find that the dough is sticking, place another layer or wax paper on top of the dough. The dough should be wider than the pie plate, about 11″ in diameter. This will give enough room for the dough to curve up and over the sides of the plate. If the dough is the width of the wax paper you’re working on, you’re in good shape. If the dough is cracking, it may just be too cold. Allow the dough to warm up for a minute and try once more. The edges do not need to be smooth, so don’t worry about it if they don’t look pretty. Carefully pick up the dough, supporting as much of it as you can, and flip it over onto your pie plate (as close to the center as you can manage) and gently, gently, ease the dough into the plate. Starting at the top of the plate and working in a circle, life the edge of the dough and mold it to fit the pie plate. You don’t want to be stretching or pulling the dough, just bending it into the pan. If it rips, simply press the dough back together. 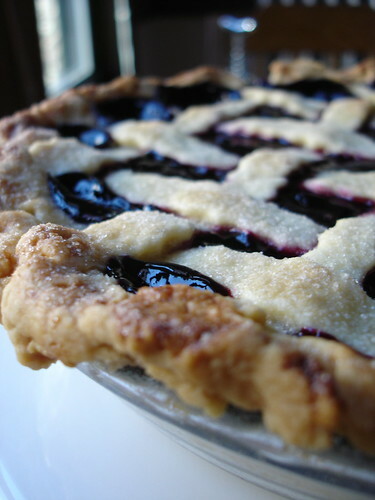 Using a fork, poke a bunch of little holes in your beautiful pie crust that you tried so hard not to rip. Don’t forget the sides! This step will prevent air bubbles from forming and help prevent the dough from shrinking. Make sure the surface is evenly covered with holes. Trim any overhanging dough, leaving about 1/2 inch where possible. Place another sheet of wax paper (your new best friend) on top of the dough and fill with your weight of choice. I used dried chick peas because it was the only thing I had in the house at the time. You can use any kind of dried bean, rice, small washed pebbles (you have those laying around, right?) or fancy professional ceramic or metal pie weights. I probably used a cup or so here; just make sure the bottom of the pie is generously and completely covered. Place your crust in the oven and bake for 15 minutes, remove the beans, and bake again for another 5 minutes. The crust should be brown around the edges, and it should be starting to lose it’s raw look. Let cool. “Blind baking” your crust will help prevent the filling from making the crust soggy. I haven’t tried this recipe without pre-baking the dough, so if you’ve had success with that in the past, skip this step and let me know how it went! Remove the second piece of dough from your refrigerator and roll out in the exact same way you did for the bottom crust. It doesn’t need to be circular, you can do a more rectangular shape if you want. If you have a pastry wheel, cut evenly proportioned strips of dough. I used a clean yard stick to keep my lines straight. The width of the strips is entirely up to you; thicker strips make for a more rustic, country pie, thinner strips look more refined. Beware of strips that are too thin, however, as these will be impossible to pick up and manipulate on top of your pie. Place the strips in the refrigerator to cool back down for a minute while you fill the pie. Ah, an easy step. Pour your (cooled) filling into your (cooled) dough. My filling was kinda sorta warm and my dough was definitely warm, and it all worked out okay. You don’t want either one to be right out hot, though. Preheat (or reduce) the oven to 350Âº. Place strips onto your pie vertically, one by one, resembling jail bars. Starting on one end of the pie, fold back every other strip. Add a horizontal strip. Fold the vertical strips back into place and repeat. See the diagram below, because I can’t describe this well enough. I’ve heard that you can even twist the lattice strips to look like streamers – try it if you’re feeling brave! Once your lattice is complete, attach the strips around the edge of the pie. Wet your fingers with the 2 Tbs of soymilk and lightly brush the lattice and the edges. Sprinkle the top of the pie with 2 Tbs sugar. Bake for 45-55 minutes until crust is golden and the cherries are bubbling in the center of the pie. Remove and let cool. It will take a while. Sleep it off. I finished my pie around 10 at night, so I let it cool on the counter until it was just warm, then refrigerated it over night. I was rewarded by a very cuttable, non-soupy pie. Wait to cut it, you’ll love yourself for it. Enjoy! This pie looks like I want to eat it. Recipe? I hope it lasts long enough for me to eat some!! I am excited to see the recipe. I have just started cooking vegan for my boyfriend and have been looking for interesting and fun dishes to make. LOVE your blog! Ahhh, I cannot wait to see the recipe! What kind of pie pan do you use? Beautiful! Was this really your first pie?? whatthehello – The recipe is posted! Let me know if you make it. stone_reader – You had two pieces. I hope you’re satisfied! You can have cupcakes later. lotta – I used a glass pie plate that has handles. Seemed to work fine, I bought it just to make the pie. rachel – Yup, it really was my first pie. Beginners luck I suppose! What I tried to comment yesterday but was not allowed is that this looks scrumptious! Hard to believe you’re not a professional pie-maker. stone-reader – There will always be cupcakes for you! mamafabun – Aww, thanks. That’s so sweet of you to say! Wow, what a gorgeous pie!! I’m definitely going to have to try this one! this looks so delicious, I have the dough chilling in the fridge right now. hmmm, i only have fresh cherries though. Will they work as an ok substitute for the frozen? This looks amazing! I was just wandering whether it will work fine with say vegetable oil instead of butter? March 25, 2008 - 5:43 pm Pingback: Ladies Tea Party in the Park « Could It Be … SEITAN? April 7, 2008 - 11:26 am Pingback: A Pie By Any Other Name Tastes Just As Sweet « Could It Be … SEITAN? Oh my various Gods, I screwed up the pate breese by adding melted butter (I melted it to make sure it was exactly measured)! I am wondering if there is a way to make this crust with less margarine? We have issues with oil (gall bladder) in our family and I would love to make pie (since it can be essentially low fat) but all the good crusts call for a ton of marg. any ideas? All the no-marg ones I have tried are hard as rocks. :) I love your cookbook!!! My first homemade pie EVER! Made this for a work party, everyone loved it! October 21, 2011 - 7:52 pm Pingback: Miniature Apple Pies « Oh my Lune!